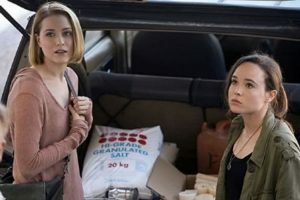 Academy Award nominee Ellen Page (Freeheld) and Golden Globe nominee Evan Rachel Wood (The Ides of March) star as sisters fighting for survival in the sci-fi-tinged apocalyptic drama-suspenser Into the Forest. Set in the near future, this riveting and suspenseful apocalyptic drama follows two sisters whose peaceful lives are disrupted one day by a world-wide power outage. The sisters must work together in order to survive in their increasingly treacherous new world, fighting intruders, disease, loneliness, and starvation. Barely released on a limited basis to theaters in early August, the movie was well-received by the critics, garnering a 79% Fresh rating at Rotten Tomatoes based upon 39 published reviews.